Thanks to Gnarled Oak for publishing my poem “Westbound PA Turnpike“. Proud of our Widener students who’ve worked hard on the new issue of The Blue Route, featuring 8 pieces by undergraduates from across the country. Welcome back everyone! To kick off a new semester, we’ve launched Issue 15, which can be viewed here! These pieces truly are the best of the best…out of the dozens of submissions we received last semester, the 8 featured in this issue truly blew us away! Take this relaxing Sunday to read each piece in the issue and get inspired, because we are reading submissions for Issue 16 now through March 1st! Continue to follow our team this semester by liking us on Facebook, following us on Twitter, and keeping up with the blog here. Best wishes for a successful and happy spring semester from everyone at the Blue Route! 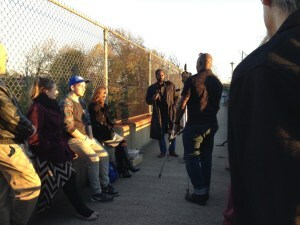 I was happy to attend this Boundaries and Bridges event on the pedestrian bridge over I-95. 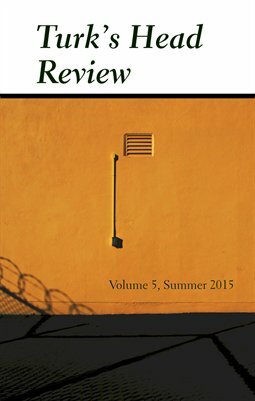 Exciting artistic developments are taking off in Chester, PA.
My poem “Haircut at the Mall” has been published at The Dr. T. J. Eckleburg Review. It’s one of several poems I’ve written occasioned by visits to shopping centers. I should really pull together a chapbook manuscript on that theme. Thanks to the editors at Eckleburg for the acceptance. In November I got to read my fiction at the State Street Reading Series at the Media Arts Council gallery in Media, Pennsylvania. Thanks to all who turned out. More on the event can be found at the Widener University English Blog. Here’s a video clip from the beginning of my story “Zig-Zag”.